Shri Brahmananda Sarasvati's resonant Sanskrit chanting and magnetic meditation suggestions transport the listener to subtle realms of sound, light and pulsation. Devotees from our East and West coast ashrams offer melodious Sanskrit hymns and instrumental segments that feature sitar, guitar and tibetan bowl. The harmonic music and meditation create an atmosphere of serenity and peace that is ideally suited for meditation, yoga, healing and relaxation. 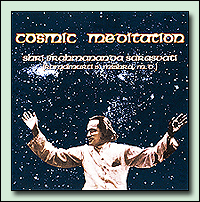 The full Cosmic Meditation CD is available in the Ashram Gift Shop or online at AshramStore.com. Copyright 2007-2019 Yoga Society of New York, Inc.